If you’re looking to keep your home safe and secure, there’s no better investment than a home security camera. 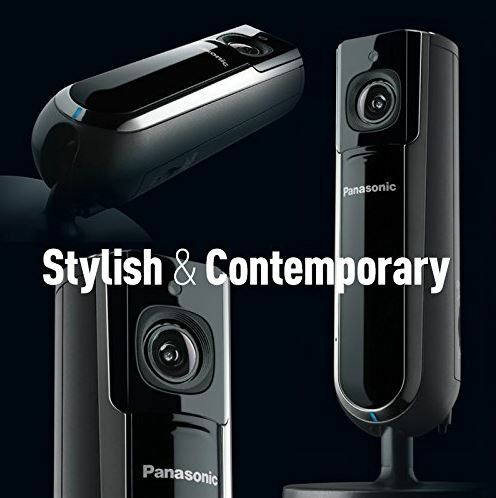 If you’ve been following us, you know that there are plenty of options for high quality security cameras that are both easy to use and reliable. But the truth is, the security camera industry is at a bit of a turning point. Recent developments in technology mean that newer models provide an unprecedented level of quality, while the older models are comparatively disappointing. That’s why we’ve been working our way through the best-selling products to help you find models that are worth your time and money. 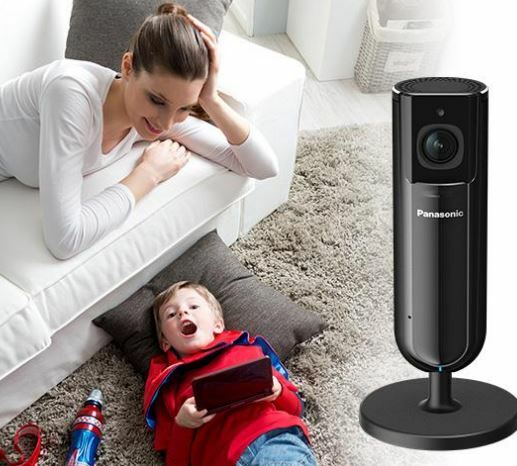 When we came across the Panasonic KX-HNC800B Home Monitoring Camera, we knew that we’d found something special. What sets it apart from the crowd is the inclusion of features that extend its functionality. This is not just a camera that can keep your home safe, but something that can be used for many different purposes. Let’s take a look and see how it performs. Panasonic is a well-known manufacturer of consumer electronics for all types of purposes. From the first time you set eyes on the Panasonic KX-HNC800B, you’ll catch a glimpse of their classic, sleek design. The camera itself is a compact pillar shaped unit that’s conveniently mounted to a circular stand. This stand can be adjusted, so you can place it anywhere you like. For us, the appearance of this camera is the perfect combination of modern and classic. It’s not so ultra-stylish that it draws unnecessary attention to itself, but still has an ‘up-to-date’ appeal about it. It will blend in to the décor of any home, making it a great choice for any consumer. This Panasonic KX-HNC800B is designed to sync up with your mobile life. 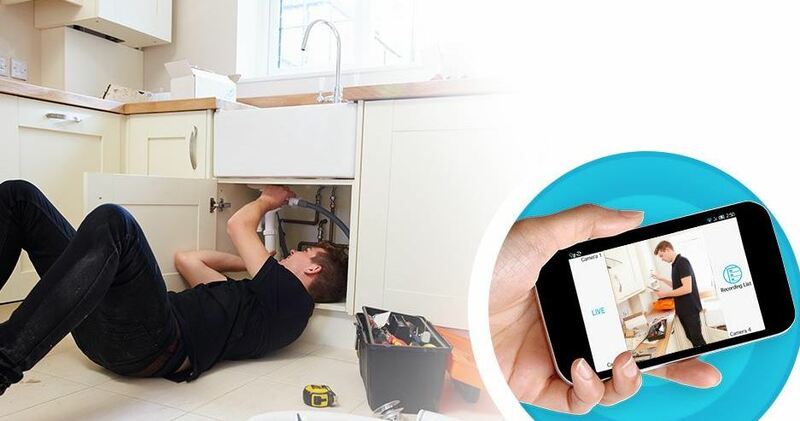 Thanks to the included Wi-Fi connectivity, you’ll be able to access the locally stored information from anywhere in the world. For most users, this will take place through the 802.11 a/b/g/n Wi-Fi. Over top of the network, the camera is maintaining the connection with Panasonic’s proprietary Home Network Systems app. This app allows superior compression and traffic shaping so you can handle a large number of devices or a large number of cameras. 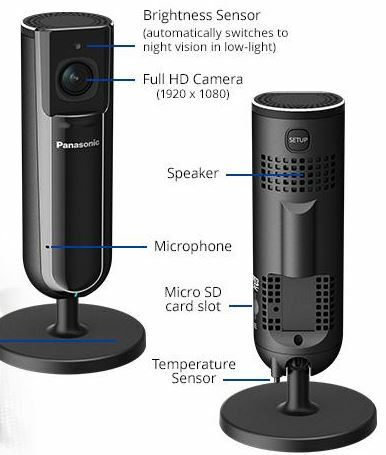 Each device, whether it be your laptop, desktop, or Panasonic home automation system, can support up to 32 cameras. Each camera can be connected to a total of 8 devices, providing them with real time updates and notifications. If you’re looking to stream video, then 3 devices can stream at the same time without any degradation to the video quality. Unlike many other cameras, data is not stored on the cloud. This means that your video will truly be live, instead of the delay you often get with cloud services. Local storage is in the form of a MicroSD card, which can store a little over 1 hour of full HD video per GB of storage. For maximum storage space, you can install up to 128GB in the camera, recording a surprising 145 hours of high quality video. It’s worth noting that this camera isn’t completely wireless. It’s got a lot of powerful features, and requires that it’s plugged into a 120V outlet. The cord they provide you is quite long, so you can still get it set up anywhere you desire. For the most part, you’re going to want to use the Panasonic KX-HNC800B in full HD mode. This means that the 2.0-megapixel sensor will produce stunning video at a smooth 30 frames per second. It’s got a 0.2m focal length, which gives you perfect focus anywhere from 8 inches until infinity. This type of lens is perfect for a security application, as you’ll never have anything out of range or blurry. But what really impressed us about the camera was the color reproduction. Panasonic has a number of digital cameras on the market, and it’s clear that the design team was involved in this one. The image sensor has a very high dynamic range. This means that where some cameras would show a dark empty space or bright flat light, this camera can handle drastic changes in light levels and capture every detail of its surrounding area. 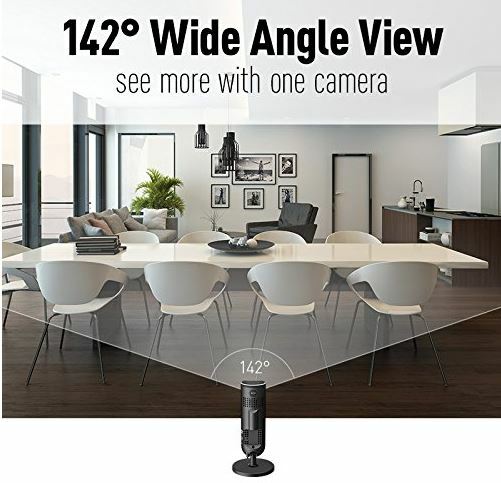 The camera has a 142-degree wide-angle lens, making it perfect for use indoors. It’s always hard to find a balance between image quality and video coverage, but Panasonic hit this nail on the head. 180 degree cameras are what they call ‘fisheye’ lenses. In order to fit all of this information into a square frame, the light needs to be bent quite a bit. This makes for an awkward ‘bubble’ shape that many are not fond of. But high quality 142-degree glass lens used in this Panasonic camera is perfectly straight, so it’s very easy to make out what’s going on in frame. When it gets dark out, typical image sensors can no longer make out any clear features. This one has both an IR LED and an IR cut filter, which removes infrared light during the day. Once it gets dark, the filter is turned off and the light is turned on. This gives you a total visible range of about 17 feet. While this isn’t the most powerful night vision camera we’ve reviewed, it’s more than adequate for an indoor environment. With most of the cameras we review, they’re set up to do just one thing – provide a video feed of a certain area. But it’s clear that Panasonic had much more planned for this handy little camera. One of the first ways they improved the design was with a high-quality microphone. This is an omni-directional unit, similar to what you’d use for an office teleconference. This means that it can pick out sound from anywhere in the office, turning even the most minute peeps into crystal clear recordings. But there is one thing that this camera has that we’ve never seen before. It includes a temperature sensor as part of its environmental monitoring system. You can set this sensor to ping you alerts in the event a room gets too hot or too cold. This is great for use in a nursery, or for looking after your pets when you’re out of the house. From your phone, you can select several different options that can improve this cameras functionality in a security application. The first one we recommend turning on is pre-recording. The camera is triggered by a motion sensor, but there can often be a delay of half a second. 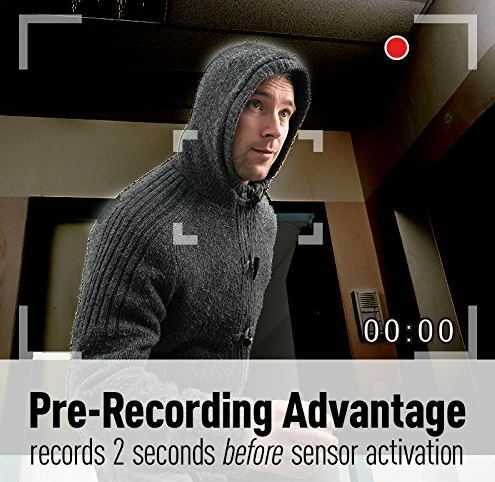 Pre-recording can mitigate this risk by automatically saving video before the sensor is triggered. At all times, two seconds of video is saved on the card. If the sensor isn’t triggered, it will be deleted. But if the sensor is triggered, you’ll have the two seconds prior saved. This seems like a minor feature, but it makes a huge difference in the event of an incident. You can also set one of several different “modes” that will auto-adjust your settings. “away-arm” is when you’re out of the house and want to record anything that happens. You’ll receive an immediate notification that is quite loud, and hard to miss. You also have the “at home – arm” mode. This is similar, but will just use a standard notification if there is activity. Finally, “at home” mode turns off all recording features, unless you specifically select it. Although the Panasonic KX-HNC800B is part of a larger kit, there’s a good reason why we selected it. The camera works perfectly fine on its own. It has some of the best video we’ve seen, and the privacy filter is a nice additive to have when you’re using it indoors. As long as you have a smartphone, you can take advantage of everything this camera has to offer. If you’re looking to create a more complete home security system, we’d recommend a few small additions. 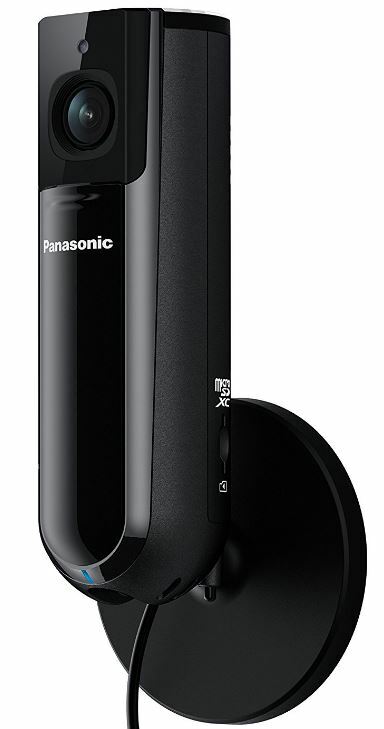 The first thing you’ll want to grab is the Panasonic Hub Unit for their home monitoring system. This lets you interconnect all of the devices, and keeps their settings synced. Then, you’ll want to add the Indoor Smart Siren. Now, whenever you’re set to “away” and somebody tries to get into your home, you’ll have a proper alarm that you can disable with your smartphone. If the smartphone disable is a little much to coordinate, it can also be controlled by the Access Keypad. Those three items can be combined with as many cameras as you want, and that’s the beauty of this system. If you just want something that can keep an eye on the kids while you run to the store, a single camera is all you need. And yet you always have the option to upgrade to this advanced security system with a minimal investment. The only thing we weren’t particularly fond of was the pet monitoring feature. There is certainly nothing wrong with it, but if that’s your goal we’d recommend that you instead purchase the Petcube Play. 7/27/17 – I have had a miserable experience attempting to install the Panasonic webcam on my Cisco/Linksys router – a rock solid router. I suffered through 8 failed attempts with three different IOS devices on the same network. Contacted Panasonic Support. A very courteous and professional support tech told me “you will be very satisfied with the camera when we get it set up”. Three more failed installation attempts occurred – one of which was an Android device which the tech said installs easier and better on an Android device – under the direct guidance of the Panasonic Support. A total of 4 hours invested in attempting to solve the issue, or shall I say hours wasted. Issue never resolved. Tech gave up. And so have I on Panasonic quality and support. Recommend the purchase of another product.